When a registry in radiography is eventually realized, it will help resolve one of the biggest challenges of pediatric radiography: variation in technique, which, most importantly, translates to variations in quality and radiation dose, says Donald P. Frush, MD, FACR, FAAP, chair of the Image Gently Alliance. "In radiography, we still have a lot of variation in the techniques that are used for kids … variations even amongst different age children," says Frush, the John Strohbehn professor of radiology, a professor of pediatrics, vice chair for quality, safety, and strategic vision of the Medical Physics Graduate Program at Duke University School of Medicine in Durham, North Carolina. In addition to standardizing technique, a registry would help those in the field of pediatric radiography overcome other challenges because it would provide data on variables such as dose and protocol use, according to Frush. "We do need to come around to make sure that we understand the proper use of technology, put out appropriate information to users for pediatric radiography, and establish diagnostic reference levels, ranges of dose, and exposures that are appropriate for kids." Currently, the ACR is "working toward establishing" a dose index registry for both CR and DR, according to Steven Don, MD, cochair of Image Gently's digital radiology subcommittee. That registry, he explains, will be based on the International Electrotechnical Commission 62494 standard, which specifies the definitions and requirements for the exposure index of images acquired with digital X-ray imaging systems. "Manufacturers have slowly been adopting the standard," adds Don, an associate professor of radiology at Mallinckrodt Institute of Radiology at Washington University School of Medicine in St. Louis. In the meantime, Frush encourages radiography practices and institutions to incorporate their own monitoring programs. "Such programs will enable us to look back and say, 'How are we doing? Are we still within standards or not?,'" he says. "Pediatric radiology and the whole of radiology would benefit from establishing benchmarks, but the real beneficiaries [would be] patients and the public with the quality assurances that are associated with departments that monitor their procedures," Don says. To help with that, Frush urges those involved with pediatric DR to seek out the Image Gently Alliance's website (www.imagegently.org). Image Gently, defined on its site as "a coalition of health care organizations dedicated to providing safe, high-quality pediatric imaging worldwide," was awarded a contract from the FDA to develop educational materials and a safety checklist for DR and CR back in 2010. In addition to the checklists, Image Gently provides links to a flowchart for DR and CR, an annual pediatric department evaluation, a fishbone (cause and effect) diagram, and a repeat-reject analysis spreadsheet. Image Gently's website also shares PowerPoint presentations and published papers that can assist with the unique challenges posed by DR, which can result in overexposure to pediatric patients, according to Frush. One of those problems is the dose creep phenomenon, which can happen when the technologist acquiring the X-ray bumps up the dose gradually with the intent of getting the sharpest image possible. "People say, 'I just want to make sure I get a good enough picture' … and they end up taking exposures at a higher level than you need to," Frush explains. "Dose creep can happen when technique charts are not being followed, or sometimes they are not even being used." Technologists using DR also should be attentive to the actual number of images they are acquiring, since it's easy to keep electronically deleting images—without any documentation—until the correct one is acquired, Frush says. "With film, you could audit better because there was a film bucket; you could look at the bucket and see how many films were tossed in there," he notes. Likewise, ignorance may be bliss when it comes to the use of postprocessing cropping of an oversized field of view, but an overexposure to the patient is the price. "You can crop areas out, and someone may not know it," Frush says. "There are collimation options that can make for final display of a nice trimmed and centered image." Using evaluations and spreadsheets and reviewing imaging guidance material can help departments manage staff accountability, which is a common problem, according to Frush. "In today's practice, there are some not wanting to take accountability for what is being done. Some say, 'Unless I really have to do something, I'm not going to do it,' or 'Is it really important?' or 'It's not my responsibility,'" he says. Imaging practices also may find it challenging to meet the needs of parents and providers, as well as their own needs, when it comes to these two unique groups. Professionals have to be prepared to knowledgeably answer questions for the parents and providers, as well as themselves, since both medical parties play a role in signing off on the appropriateness of the procedure. Aware of the demands of such a task, Image Gently offers web pages that facilities can promote to parents (www.imagegently.org/Roles-What-can-I-do/Parent) and providers (www.imagegently.org/Roles-What-can-I-do/Radiologist). Each is designed and written to target and educate the given group; the page for parents, for instance, has links to graphics and explanations about how DR is a comparatively low-dose procedure, Frush says. To further help manage the unique considerations of pediatric patient care for more complex imaging procedures, many radiology departments are bringing on child life specialists, according to Emily Rogers, MS, CCLS, lead certified child life specialist in medical imaging at Ann & Robert H. Lurie Children's Hospital of Chicago. "A child life specialist appropriately prepares both the child and family for a radiology experience by utilizing many different resources/techniques based on the individual child's need, to ensure their understanding and promote positive coping and compliance to support a successful experience," she says. Professionals hospitalwide are always looking for ways to make the hospital setting less daunting for children. For example, Children's Healthcare of Atlanta is using remote-controlled electric cars to drive children from the waiting room to various areas in radiology, according to Radiology Manager Carl Saylors: "The cars are a big hit with the children and parents. By using them, we hope the child remembers the cars instead of any pain that may have occurred during the procedure," he says. Leslie Burton, who formerly worked for a developer of radiology fixtures, came up with an idea that is getting kids to hop right up for the X-ray. A trip to the barber shop, where he saw young ones delighted to get their hair cut because they could simultaneously sit in a colorful car, inspired him to develop a child-size bike that attaches to a radiography machine. "Children want to sit on the bike and, often times, do not mind having the straps put onto them because they feel like they are on a ride," says Burton, founder/president of The Burton Bike Child X-Ray Restraint. "The bicycle and mobile used with it are readily recognizable to the child and therefore ease a lot of tension for everyone, providing a calming effect which goes a long way in allowing the technologists to get the pictures they need for the diagnosis and treatment of the child." • Carestream's Sarah Verna, worldwide marketing manager for X-ray solutions: "Radiologic technologists need to have a heightened sensitivity to pediatric patients … A chest X-ray for a teenage girl is very different than for a teenage boy, due to modesty." • FUJIFILM Medical Systems USA, Inc's Robert Fabrizio, director of strategic marketing, digital X-ray, and women's health: "Education and monitoring exams are critical, especially with pediatric patients. It is essential that the technologist understand and correctly and routinely utilize all of the low-dose capabilities of today's latest DR technologies. Advances in detector sensitivity, image processing, and grid elimination software can help dramatically lower dose without jeopardizing image quality." • GE Healthcare's Brien Ott, global X-ray marketing product manager: "It's critical to have the right combination of detector capability and image processing available to see fine details and provide high resolution … Children move a lot, which presents a challenge in preventing artifacts and repeat images. 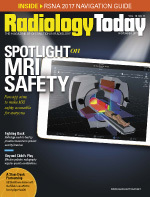 In fluoroscopy, balancing low dose and noise in the image can be a struggle." • Konica Minolta Healthcare Americas, Inc's Guillermo Sander, senior strategic marketing manager of digital radiology: "Generally, it is more difficult to image small structures and bones in X-ray imaging; this is compounded in pediatric imaging." • Siemens Healthineers North America's Joseph D'Antonio, director of radiography, fluoroscopy, mobile, and twin robotic X-ray products: "Typically, with pediatrics, a parent is in the room with the child. If the child is stressed, the parent is stressed, and that often leads to stress for the staff as well." D'Antonio adds that "motion is a challenge, so exam speed and automation are key to help minimize the need to repeat exams" and stresses the importance of keeping the dose low. "Radiation exposure is cumulative over the lifetime of a patient." To meet such challenges and more, equipment developers must keep a number of factors in mind. Sander says, "There are many variables in X-ray imaging—age, size, body habitus, and patient movement—and all of these are heightened in pediatric patients." The representatives also shared some details about the equipment their companies developed with such variables in mind. • Carestream: "A cesium iodide scintillator allows for high-quality images with lower patient dose. A wireless design eliminates the problems that can be encountered with patient positioning, and small format 10- X 12-inch detectors fit into pediatric incubator trays to allow imaging without disturbing these tiny patients," Verna says, referencing the company's DRX 2530C detector. • Fujifilm is launching a full line of pediatric-specific products. This includes the FDR D-EVO II Csl, which "offers gentle dose without sacrificing image quality," says Fabrizio, adding that it is available in three sizes, including one specifically designed to fit neonatal trays. FDR AQRO is a dedicated, low-dose, mini mobile DR system with antibacterial coating. FDR D-EVO GL is the "world's only single-exposure, long-length DR solution at 17 X 49 inches, for scoliosis and long-length exams." • GE: The company's Precision 600FP digital flat-panel fluoroscopy system has three dose modes and can achieve one frame per second fluoroscopy. Its newest digital portable X-ray system, the Optima XR240amx, includes the FlashPad HD—a 100 µm digital detector. QuickEnhance, a one-touch reprocessing feature, provides unique contrast enhanced images for line visualization, says Teri Fischer, the company's clinical design leader. GE Healthcare offers automatic image pasting capabilities at the wall stand as well as at the table on many of its fixed radiographic systems, including the Discovery XR656 Plus and Optima XR646. • Konica Minolta: The AeroDR HD Detector covers the panel with 100 µm pixels for a 3488 X 4256 pixel count—up to four times more than standard resolution panels, Sander says. "A user-selectable high dynamic range mode aggregates data to provide faster processing, wider dynamic range, and high contrast for larger anatomies," he says. An optional pediatric digital imaging package features specialized software activated by a patient's birth date to set user-defined settings. This enables reminders such as to remove the grid or vary the X-ray technique in order to follow the guidelines dictated by clinicians to reduce dose. The system collimator light can be operated from the control room. "This allows the technologist to verify positioning prior to exposure," Sander says. • Siemens: A company release reports that its Multitom Rax Twin Robotic X-ray system allows users to perform exams for multiple purposes including emergency medicine, interventional procedures, pain management, and orthopedics, as well as conventional 2D radiography, fluoroscopy exams, and angiography applications. It is said to be able to acquire 3D images under a patient's natural weight-bearing condition—whether the patient is seated, lying down, or standing. "Radiography, in children, is a very valuable and safe tool, but radiography does have its challenges. Professionals should continue pushing to overcome them because the technique is still the most widely used in the United States, as well as across the globe," Frush says. Individually, pediatric radiography and fluoroscopy account for 18% of all radiography performed, he notes. "That's higher than CT, which is 6% to 10%, and nuclear imaging, which is probably between 1% and 5%," he says.